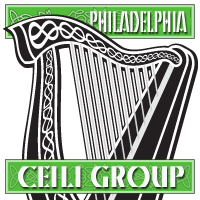 The Digital Library has recently joined in partnership with the Philadelphia Ceili Group to digitize and make freely available the content of a unique collection. For the first time in the history of the digital library project at Falvey Memorial Library, users will be able to hear as well as view and read digital library content, as the digitized field recordings of the Ceili Society’s annual Traditional Irish Music and Dance Festival come online. Years ago the Ceili Group elected to deposit with our special collections department their festival recordings archive: nine boxes containing 339 cassette tapes and 53 VHS tapes, encompassing 20 years of main stage performances as well as other events such as workshops and lectures. Falvey special collections already held other materials central to study of the Irish-American experience, most notably the McGarrity Collection, so the Ceili Group collection was a welcome addition. Unfortunately, at the time the library did not own the hardware necessary to make the recordings available to our users, and so this rich collection acted as more of a deposit, preserved in storage but never accessed in the 20+ years it has been with us. Now, thanks to both the digital revolution and the extended capacity of VuDL, Falvey Library’s homegrown open source digital library software, to handle a variety of new formats, including mp3 and WAV audio files, recordings from the Philadelphia Ceili Group’s audio collection are now for the first time becoming accessible by the general public. Converting the analog source materials to digital form is a multi-step process, requiring certain special pieces of equipment as well as attention to standards of digital audio preservation and access. The basic transfer routine we currently employ proceeds thus: the analog source (a cassette tape), is played on a Tascam 202MKV cassette deck, output to and converted to a digital signal by an M-Audio Fast Track Pro digital audio interface, and then relayed to a 2 GHz Intel Core MacBook Pro laptop, where the unaltered digital signal is captured in an Audacity project. This Audacity project is subsequently used as the basis for all of our preservation- and access-quality audio files. There are two essential variables to consider in capturing a digital audio signal from an analog source: sample rate and bit-depth. Sample rate refers to the number of times per second the amplitude of an audio signal is measured, and bit-depth refers to the number of points measured each time a sample is taken. For example, CD-quality digital audio is captured at a sample rate of 44.1 KHz (or 44,100 samples per second) and a bit-depth of 16-bit (or 16 measurements per sample); originally established as a compromise between adequate sound quality and relatively modest file sizes, CD audio is generally considered too low a standard for archival preservation. With the aid of some guiding documents, including the Council on Library and Information Resources publication The State of Recorded Sound Preservation in the United States, and a document from the Consortium of Academic and Research Libraries in Illinois entitled Guidelines For The Creation Of Digital Collections: Digitization Best Practices for Audio, we settled on a standard for this and future digital library audio preservation masters of a 96 KHz sample rate at a 24-bit depth. Next to consider are the file formats used for both preserving the audio documents and for providing users with convenient access to them. The high-quality digital audio signals captured in Audacity are exported as-is to WAV files, the “lossless” (retaining both the original sample rate and bit-depth) format chosen for our preservation-quality digital documents. These files are unedited segments, each an entire cassette side in length. After the preservation level WAV file is created and stored, a copy is made of the original Audacity file and used as a template to edit the content into individual song-unit tracks. These tracks are then exported both as lossless WAV files and as compressed mp3 files. In the interest of conserving precious disk space for the entire digital library, we’ve been mounting and making publicly available only the access-quality mp3 files–not an accurate enough reproduction of the original source material to suffice as a preservation format, but more than adequate for a pleasurable and informative listening experience. And what’s available so far? The first phase of the Philadelphia Ceili Group digitization project currently consists of five sets of music from the group’s annual music and dance festival from 1996. Although just a tiny subset of the entire archive (our current holdings of which cover every festival from 1977 to 1996; the Ceili Group also has the recordings from 1996 to the present at the ready), even these few sets are rich in excellent selections spanning a wide range of tones, performers, instruments and styles. Check out an original tune by renowned balladeer Andy Irvine entiled “Brackagh Hill”, the centuries-old lament “Farewell to Music” performed by harpist Ellen Tepper, and this set of jigs by the band Craobh Rua. The individual tunes are edited such that any relevant stage announcements are included in the track, in most cases making it possible for the listener to learn a little about the history of what they’re hearing (as well as making it quite a bit easier to gather metadata for inclusion in digital library records! ); also available within each set is an mp3 file of the set in its entirety, allowing listeners to experience the sequence of tracks from start to finish without having to click on each individual song. The Villanova Digital Library’s partnership with the Philadelphia Ceili Group is a fantastic boon for Irish Studies scholars and Irish music enthusiasts alike. Piloting the inclusion of audio collections in the digital library with these unique resources makes perfect sense for a special collections department already so rich in Irish Studies materials, and Falvey Library and the Irish Studies Program on campus will be celebrating this milestone together on March 22nd at 5pm in the Speakers’ Corner area of the library with a festive commemoration ceremony featuring live music and dancing, poetry and song, lectures, refreshments, and general gaiety. All are welcome to come by and celebrate with us! This will be great for people to hear as well as view and read digital library content.